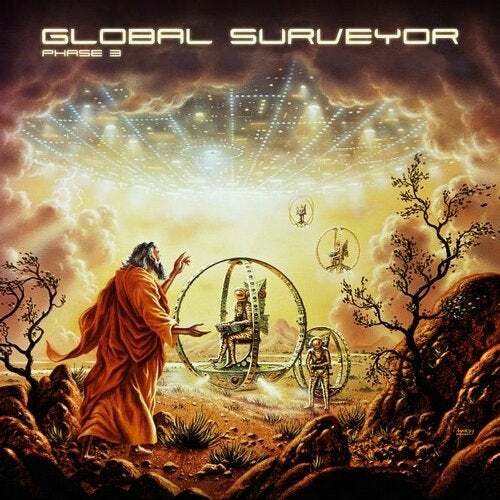 Survey The Globe! Reaching back to the year 1998 A.D. - kicked off by Dagobert and Prime Dominance - the "Global Surveyor" various artist Electro space saga now goes into its third round with 21 fresh melodic deep space newschool Electrofunk & Electronica tracks collected from all around the globe! Artists include Gosub (Isophlux, Citinite), Dynamik Bass System (Dominance Electricity, Gigolo Records), Middle Men (aka Phil Klein (Bass Junkie of Breakin Records, Battle Trax) & Jim Kneen), Mesak (one half of the Finnlands Mr Velcro Fastener), Keen K (Over X-Posure Records), Paul Blackford remixed by Sol_Dat (Breakin Records), The Exaltics (Solar One Music), Supreme.ja (Subsonic Device Records), Dominance Electricity's resident artists Sbassship and Dagobert.as well as fresh new talents Weltwirtschaft, Kalson, Direct Control, LectroiD, CPU, Audio Genetics, Phundamental, DJE, The Future and Cosmic Rockers. Cover illustration by Space Art Legend David A. Hardy. Be prepared to be hijacked into distant colorful worlds of futuristic sounds from classic newschool electrofunk to spacy ambient tracks. Dominance Electricity - Die Vorherrschaft in dieser Galaxie!